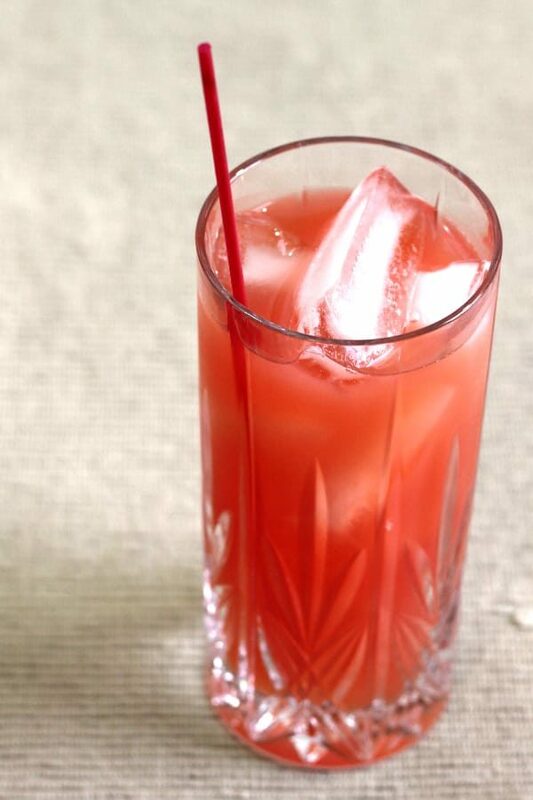 The Red Death is a sweet cocktail that blends a number of fruity flavors together: berry, orange, pineapple, peach and blackberry. The result is pretty delicious. As fruity as this drink is, it’s also complex. That’s because it blends so many fruit flavors together, and some of them aren’t that common together. The blackberry in particular adds a deep, dark note. And the peach gives the whole drink a mellow note, sometimes totally unlike the berry, citrus and pineapple. The sloe gin adds a very sweet berry flavor, which also contrasts with the citrus in a wonderful way. Sloe gin is intense, but it’s great when it’s blended with other complementary flavors. This is an easy enough drink to make, despite it having so many ingredients. It’s easy to make in advance for guests, big-batch style. It goes over well at parties because most people love it. If you’ve got any guests who refuse to drink a fruity cocktail for love nor money, it’s their loss. Toss ’em a beer. Because of the name, I recommend this one for Halloween parties. It’s almost blood red, the name includes the word “death”, and it’s absolutely delicious. This drink is also wonderful for enjoying after dinner, as a dessert drink. It’s sweet enough to replace a light dessert, with a nice dose of alcohol. This is a great drink to savor and enjoy. Try one the next time you’ve got time to sit a while and sip along. It’s great for unwinding. I actually recommend it for an evening when you’re reading a book or watching TV. It’s a nice little treat for when you’re just staying in and chilling out. This isn’t the easiest cocktail to pair with food because it has such a complex flavor. It’s great with salty snacks – pretzels, nuts, parmesan crisps. It’s also good with straightforward dishes like lemon pepper chicken or fish. But probably the best way to enjoy it is all by itself, in the evening or even as a nightcap. The Red Death cocktail recipe features Southern Comfort, vodka, sloe gin, flavored brandy and fruit juices. It's a fruity, delicious drink. Pour in all ingredients and shake until chilled. Fill a highball glass with ice and strain the mixture into it. I never used black berry brandy or pineapple juice. I use amaretto and a splash of lime juice instead. Tastes like hawaian punch. You know you had too many when your face goes numb, then it’s too late.